I want to nominate my husband, Brandon Terrell for the Hard Working Man contest because he is not only the best husband and father I know, he’s also the hardest working man I know. Since our son Gavin has been born, Brandon has worked from home doing Real Estate in order to be home with our son. 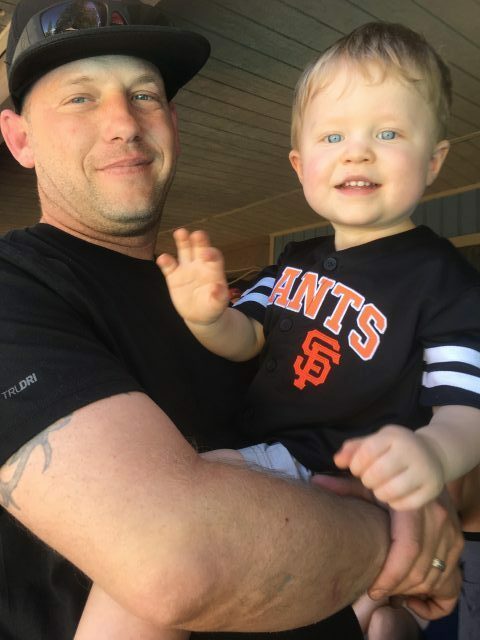 Real Estate has recently slowed down for him which prompted him to get another job working nights and he still got up early to take care of our son during the day. He now works full time during the day as well as doing real estate nights and weekends. If he gets home after Gavin has already gone to bed, Brandon will take him out of his crib and rock him in our rocking chair, just to get that extra time with him. He goes above on beyond for his family daily and I can’t think of a better man to win this contest. My fiancé Bryan is the hardest working man that I know. When he is on the clock for Dollar Construction, the subcontractors and his coworkers all call dibs on who gets to work with Bryan, because he is a workhorse. He is very knowledgeable in the trades, but also very eager to learn and that has given him a solid reputation in our community. Bryan doesn’t know how to not work, but he loves it! His idea of a vacation, for example is this: we recently went to Santa Cruz for a long weekend, Friday through Monday. We stayed at a nice hotel on the beach. He picked up a tile job with a contractor friend who lives in the area, and on this “vacation” he tiled a fireplace mantle during the day, and our evenings were spent pacing the beach and dining out. When we came home after this “vacation”, this hardworking man actually felt relaxed and recharged despite the fact that he spent 8 hours a day for 3 days working! Bryan has a reputation for blasting old country music on every job site, answering to the nickname “Cuts Like A Knife” (for obvious reasons) as well as his strong work ethic and his passion for the trades. Bryan loves getting dirty putting in long and hard hours. He is constantly working from sun up to sun down, to provide for his family. He takes pride in his work and loves it. There aren’t a whole lot of men like that these days, and I just say that I am so lucky to have him! That’s why Bryan Adams is the Hardest Working Man I know. P.s he is always talking about the latest Hard Working Man and will stop and congratulate the newest winners when he sees them around town! I really think that if he wins this, it will really make his day! Justin works over 40 hours a week and does side work for friends and family after work and on weekends. He is always there to help everyone he knows with car trouble, House work, moving and anything else that might come up. He is a dedicated husband, father and pet owner and does everything to make sure those he cares about are well taken care of and happy and always seems to find the energy to have adventures with his family. Ryan is not only a Husband, father of 3 girls (including a baby), he is the principal of our local Highschool (Tioga) and he teaches almost as much as a full time teacher as well as runs the school. He has been working on our home projects because we just moved into a home with lots of projects that needed to be done. To save our family money he took on all these projects. One thing he did was laid all new flooring by himself. He plays with all of his girls, gets off from working more than a full time day at work where he takes care of the communities children and comes home and helps his girls with their homework, runs them to Sonora to their soccer or cheer practice. He pushes the baby around in her stroller when she’s fussy after working all day. He treats local children as if they are his own often giving rides or food to them if they need it. He always encourages me to be better and is my number one fan as a teacher myself he knows how to balance us all out and keep God at the center of our family. I just wanna say thank you as his wife and for this community for having such a loving and caring man that does so much extra to make sure he’s involved in the community that he runs a school in. I’m not sure many people know how many “other” responsibilities he has at home? He never sells his family Short from all the time & effort he gives at school.